Map positioning allows you to set the initial center, zoom, pitch, and bearing of the map. To learn more about what these controls mean, see the Shortcode Documentation here. 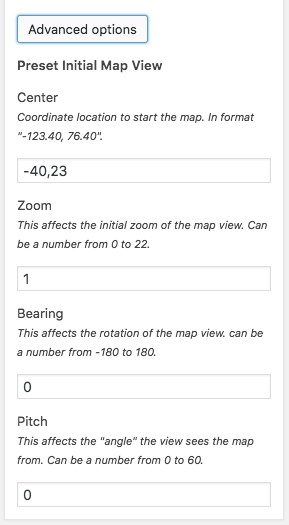 You can set any of these numbers in the “Advanced Options” area of WP Mapbox GL JS. This appears after you click the “Advanced Options” button on the right hand side of the map editor.